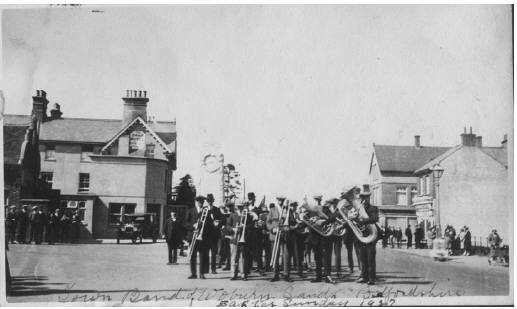 The earliest organisation appears to be the Brass Band of the Temperance Recreation Club. This was formed by Mr Frederick Croxall Boultbee, who built ‘Homewood’, and he gave the band the use of the old cottage which stood in his grounds, for a headquarters and for practices. 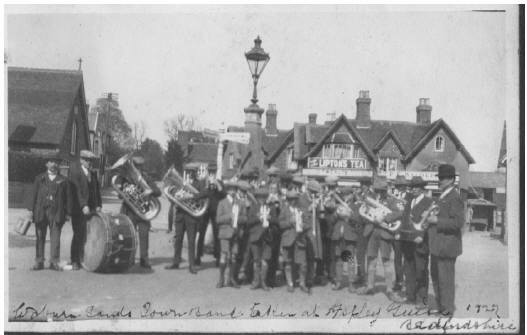 The band started soon after he came here in 1885, for it played for the Service Song in Church on Easter Sunday afternoon in 1887, and for the many festivities held in that Jubilee year. The bandsmen wore uniform for the first time at the Easter Sunday afternoon service in 1888. The Woburn Sands Band playing in the Square. From an undated postcard. Various journals have reported that the band was formed by that ardent musician, Harry Seabrook, but that probably arises from hearsay; Seabrook was only seventeen years old at the time and was not then a master of notation. It was only in 1891 that Harry received lessons in music and organ-playing from the then organist, who was losing his sight, and from whom he later took over the Church organ, and years later became conductor of the Band. The Band had a chequered career, collapsing soon after Mr Boultbee left in 1889. In 1892 the Trustees met to consider its future, and it was decided it could only be placed on a good footing if its membership was open to all, but that the Bandsmen must conform to the rules, and one of the most important words there was “temperance”. 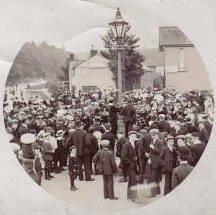 In 1897 the Band again provided the music for the Jubilee celebrations, heading the children’s parade round the village, and playing at the teas, and apparently putting in a very full day. It continued for some years, for in 1910 it is reported the Band won an award in a competition at the Crystal Palace, but with the outbreak of War in 1914, it was forced to disband. However the old hands soon got to work again when the War was over, instruments were dug out of their store (one of the sheds at Giles’ Saw Mills) and once more the sound of music was heard, especially on Sunday evenings in the summer, when they performed outside The Swan, in the Square. But the 1939 War caused another break, and the instruments were again cocooned; indeed when the War ended and the Band wanted to reform, there was some difficulty in finding the instruments. A bandmaster could not be found; outsiders were willing to accept the appointment if well paid, but a Bletchley man eventually undertook the task. The British Legion was approached and agreed to take responsibility for the Band, under its own name, but this led to a lot of unfortunate argument; in fact the playing members, though wanting financial help, would not accept outside control, so the Legion withdrew, leaving the men to overcome their own difficulties. Fortunately, Remembrance Sunday (1948) brought the Band together, and fifteen men turned out to march the parade to Church. The Band played carols at Christmas and netted nearly £100, and from that time on they have continued a successful career. The band has been conducted by Mr. Len Jenkins since 1976. Two early recordings of the band, ‘Men of Harlech’ and ‘Mood Indigo’ are featured on the album “Brass Roots Vol.1 The Bands of Milton Keynes and District“, from 1978. The modern Woburn Sands Band plays regularly at local events., and has released several CD’s of their music.